Offering a fascinating blend of past and present is the Logan Station Condominium, located in—you guessed it—Logan Circle. Designed by Division 1 Architects and delivered by Bogdan Builders in 2007, this adaptive reuse project began with a wonderful Victorian row house built in 1895 and used it as the end-piece to complement a four-story modern complex with square black bays jutting out from a brick facade. 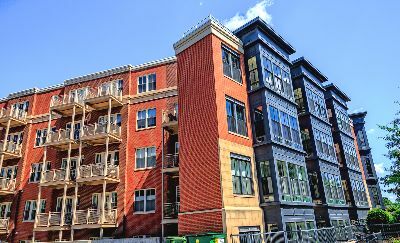 Located at 1210 and 1224 R Street NW in Washington, DC’s 20009 zip code, this high end community offers 63 residential units and one ground floor commercial space. The complex wraps around the corner at Vermont Street. First floor units function as townhouses with individual street entrances, while upper floor units function as luxury flats. That’s apart from the penthouses, naturally, which are bi-level. As for the residences in the old restored row house, you’ll find townhouse layouts with up to 1400 square feet of space, plus beautiful bay windows, hardwood floors and all the same luxury amenities as is the newer building. Also worth noting is that all of the condos for sale come with parking and extra storage space. Condos for sale at Logan Station come with a price, starting in the $400s for the smallest units and climbing up to over a million dollars. Sizes range from around 609 to 1756 square feet. Even the smallest units are plenty fancy, with 10-foot ceilings, premium finishes, hardwood floors, and gourmet kitchens with cherry cabinets, stainless steel appliances and granite countertops. Plus, all units come with 42” plasma TVs as standard features. And then there’s the penthouses with exotic wood flooring, Sub-Zero and Wolf appliances, and private roof terraces. A pet-friendly community, Logan Station is on the northern side of the circle, and just a block from the Cardoza Playground and Shaw Rec Center. It’s also walking distance to both the U Street and Howard Metro Stations. There is also a nearby Whole Foods, Vida Fitness Metropole, and tons of great bars and restaurants.